Bridge-o-Rama's nine Signature Experiences a+re just the tip of the Bridge-o-Rama iceberg. We also have more than 30 highly focused events taking place all over West Dallas (and beyond) that will be free and family friendly. Review all of our offbeat, intriguing, and mind-expanding official events that will take place next weekend. To kick off the bridge opening celebrations, Jim Lake Companies hosts an open-to-the-public Design District Diversion and Bridge Weekend Kick­off in the Design District with complimentary beer and wine, food, live jazz, and art. When: Thu., Mar. 1, 4-7 p.m.
"Bridged" will feature drawings, paintings, video, photography, sound, sculpture and site-specific installations by MFA candidates in art programs at SMU, TCU, University of North Texas, University of Texas at Arlington, and University of Texas at Dallas. When: Fri., Sat, and Sun., Mar. 2-4, 10 a.m.–6 p.m. In honor of 40 years of serving West Dallas families, the Los Barrios Unidos Community Clinic is pulling out the stops with an anniversary celebration that offers the chance to access pediatric screenings and services while enjoying music, clowns and a bounce house. When: Sat., Mar. 3, 10 a.m.–2 p.m.
On the grounds of the Bataan Center, West Dallas Community Centers, Big Thought, the SMU Meadows School of the Arts, the La Bajada Neighborhood Association and the Los Altos neighborhood will present a Youth Arts Pavilion. When: Sat., Mar. 3, 11:30 a.m.-2:30 p.m.
Mercy Street will be going to bat for West Dallas by hosting a Home Run Derby at its Field of Dreams baseball park. Preceding the derby will be a presentation of the future of the complex, which when completed will offer 12 acres of fun. When: Sat., Mar. 3, 2-4 p.m. Among those participating in this event staged by LIFT and Dallas Area Habitat for Humanity is John Neal Phillips, who wrote "Running with Bonnie & Clyde." Also, noted sculptor Jesus Moroles will give a talk on his work with granite. When: Sun. Mar. 4, 1:30-4 p.m.
Where: Habitat for Humanity, 2800 N. Hampton Rd. Bridge-o-Rama and our sister celebrations will take place as planned on March 2-4. News reports have confused some as to when the bridge will be open to vehicular traffic. 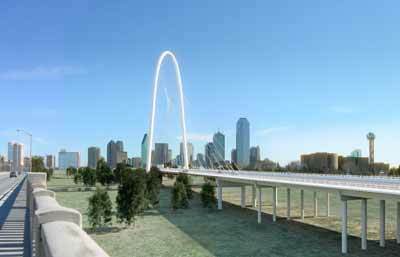 The City of Dallas and TXDoT had hoped that the bridge would open to vehicular traffic at the conclusion of the public celebrations. However, as the City has announced, "due to weather conditions, mainly much needed rain, portions of the construction will take a few more weeks than anticipated." No matter to us! We're still rocking the bridge March 2-4. 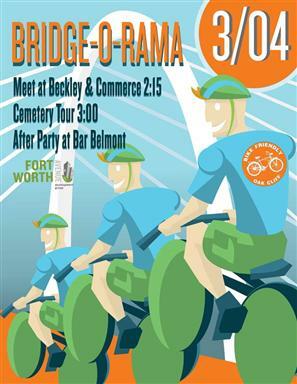 Bridge-o-Rama will take place rain or shine. There, we said it! Of course our official weather policy is: It's not going to rain. Due to the bridge celebrations, especially on March 3, there will be greater traffic and (during the Parade of Giants) temporary street closures that may disrupt residents and businesses usual flow of activity. Please plan for temporary disruptions. Here is an advisory for our West Dallas neighbors near the Margaret Hunt Hill Bridge. Dallas’ greatest opportunities and most intractable troubles have long been wound together in the open land and scattered neighborhoods south of the Trinity River. Now, seeking to capitalize on those opportunities and minimize the troubles, Mayor Mike Rawlings is unveiling a plan he hopes will bring economic growth to eight key corridors of southern Dallas and help change perceptions of the entire area. Returning to a key plank of his campaign, Rawlings sat down this week to discuss details of the plan that he will roll out Monday at a community meeting in the Cedars. “Growing southern Dallas is one of the most important things I feel I can do as mayor, and I want to make sure we do this in an organized fashion,” he said. The plan, crafted over months with city staff, boils down to building on successes by focusing money on key areas, leveraging new investment as those areas grow and shifting attitudes by cleaning up and marketing the neighborhoods of southern Dallas. Past mayors, including Rawlings’ predecessor, Tom Leppert, had their own plans for improving southern Dallas that often made little progress. But certain parts of southern Dallas have changed for the better — dramatically in some cases — over the past decade. Rawlings pointed to the Bishop Arts District and to Pinnacle Park, near Interstate 30 and Loop 12, where strong private investment has taken root. And he talked about West Dallas and the area around the University of North Texas at Dallas, where major public investments can be capitalized upon. Investors need to know that these are the places where the returns will be, Rawlings said. “I’m a salesman, unabashedly, about the investment opportunities I think exist. And I want to be clear about where I’m going to be spending my time in my administration,” he said. He said he is already working to bring investors to the area to show them what has been done and what is coming. West Dallas Gateway: Overhaul Herbert Street north of Singleton; continue work on restaurant district; build new Continental pedestrian bridge; replace Sylvan Avenue bridge; make improvements recommended by Complete Streets Demonstration Project. Pinnacle Park: Begin construction of new frontage road along the south side of I-30 from Cockrell Hill Road to Westmoreland Road; begin construction of 130-unit Hillside West apartments on West Davis Street. North Oak Cliff: Complete “Main Street Plan” for Jefferson Boulevard and strategic plan for Bishop Arts District; begin construction of Oak Cliff streetcar starter line; make improvements recommended by Complete Streets Demonstration Project and zoning changes consistent with Oak Cliff Gateway land use plan. Greater downtown/the Cedars: Support funding requests for residential and hotel projects; complete South Lamar streetscape improvements; review operations at Dallas Farmers Market and consider options; complete design for Riverfront Boulevard reconstruction south of Cadiz Street. Lancaster Corridor: Start construction of Lancaster Urban Village mixed-use project; make improvements recommended by Complete Streets Demonstration Project; initiate affordable-housing plan at the Kiest and VA Medical CenterDART stations; work with the VA Medical Center to build a pedestrian bridge over Lancaster Road. Education Corridor: Overhaul water, sewer and roads; finalize plans for grocery store on Simpson Stuart Road; complete design for Complete Streets Demonstration Project on Camp Wisdom and Simpson Stuart roads; re-establish relationship with BNSF railway for potential intermodal facility; consider pursuing state funding for additional campus buildings at UNT-Dallas. DART Green Line Corridor: Initiate affordable housing and other development at MLK, Hatcher and Buckner DART stations; improvements recommended by Complete Streets Demonstration Project; continue construction of Fair Park Estates single-family development. Red Bird: Hire aviation coordinator to oversee land development at Dallas Executive Airport and Love Field; finalize approvals for Wal-Mart Supercenter at I-35E and Ledbetter Road; complete Home Depot distribution center expansion; identify potential private developers at Executive Airport. Rawlings held back some details of his plan for Monday’s meeting. But he said those ideas involve new financial tools for investing in the area, giving a hand up to schools and strengthening neighborhood organizations. He spoke at length, though, about where he wants to see City Hall focus its efforts during his time in office. And he said he wants to see results soon. He called for the city to make Jefferson Boulevard, near Bishop Arts, a main street for north Oak Cliff. That means not only improvements to the streetscape, but also engagement with building owners to set a strategy for the future.“This is our complete street right there. Let’s just make this thing come to life,” he said. He wants to see 2012 bond money committed to extending Herbert Street as a main street in West Dallas. And he wants a focus on improving basic infrastructure around UNT-Dallas and seeing a frontage road built along I-30 at the Pinnacle Park development. Other ideas include improvements to the Lancaster corridor near the Veterans Affairs hospital, re-engaging the plan to build up the inland port, and driving development to the corridor along DART’s Green Line in southeastern Dallas. The plan also involves efforts to shift perceptions throughout North Texas about southern Dallas. Rawlings, former chief executive of the advertising firm TracyLocke, is calling for the city to hire a “brand manager” whose sole job will be to market southern Dallas. “I’m a marketing guy, so I’m going to be staying very close with this person,” he said. He wants to have ad agencies donate services to support the marketing plan. And there is good news to market, city officials say. Crime in all of southern Dallas is down 33 percent from eight years ago. The area can boast that it is home to two nationally ranked magnet high schools. And few parts of the region have as many transportation options. The area will be easier to market if it’s cleaner and more welcoming. As part of that effort, the city plans to demolish 250 nuisance buildings this year, roughly the same number it destroyed last year. Rawlings also wants to see the city help distinguish major neighborhoods with attractive gateway signs, of the sort recently erected in Pleasant Grove. Southern Dallas is often meshed together in many people’s minds when, in fact, it is composed of distinct and diverse neighborhoods, such as South Dallas, Mountain Creek, Red Bird and different sections of Oak Cliff. Council member Tennell Atkins, who headed Leppert’s Southern Dallas Task Force, praised Rawlings’ plan as the right approach. “This mayor feels like we have a product, and that product is southern Dallas,” he said. The product is also opportunity, he said. “UNT, that’s an education opportunity. You know the institution is going to be there. You look at Bishop Arts and you know that’s a great opportunity. You’ve got Methodist hospital there, and a streetcar line coming. Look at the Cedars. Look at West Dallas. Southern Dallas is a good product for the city of Dallas,” he said. But not everyone is so sure about the plan. Michael Sorrell, president of Paul Quinn College and a respected southern Dallas leader, said that he knew nothing about Rawlings’ plan and that no one had approached him to discuss it. Paul Quinn is an important part of the “education corridor” around UNT-Dallas that Rawlings identified as one of eight critical areas of focus. Sorrell lives with the challenges that major parts of southern Dallas have presented for generations, and he is clear-eyed about the difficulty of overcoming them. “To create lasting, substantial, meaningful change, there are some fundamental things which have to occur. You can fix housing stock, you can provide investment dollars, but if you don’t address the pervasive lack of preparation, of educational opportunities and of readiness for the citizens, then I’m not sure how you don’t wind up in a situation, even with all the best intentions, where you don’t maximize your opportunities,” he said. Investment in land, infrastructure and business, without investment in the people of the area, “can lead to unintended gentrification,” Sorrell said. City Hall understands change will come slowly. And Rawlings said he wants to see all of southern Dallas participate in the change through stronger neighborhoods. The city can provide help, but he’s under no illusion government can do it all, he said. It will take investors, leaders and the people of southern Dallas, he said. “So much of this is outside of the big-C City’s purview. The city, the institutional city, can only do so much,” he said. along with the required Thoroughfare Plan amendment process. or Pam Thompson at (214) 671-9825. The Latino Cultural Center (LCC) is showing “White Steel, Blue Skies: A New Icon for Dallas’ Skyline.” The center invited Latino photographers from North Texas to photograph their takes on the bridge’s architecture to commemorate its opening. The winning submission of the third annual Trinity River Corridor Photography Contest also will be exhibited. Jim Lake Companies and the Dallas Design District Blog are hosting a kick-off celebration for the opening weekend of the Margaret Hunt Hill Bridge from 4 p.m. to 7 p.m. at The International on Turtle Creek. Drinks will be complementary, and fare from the Easy Slider Truck will be on the menu. Roberto Verastegui and his jazz trio will perform while attendees partake in photos of West Dallas and the new bridge by photographer by Dave Kozlowski, Harman’s prints of historic Dallas neighborhoods taken by David Anthony, and other works from Galerie Zuger. Stay tuned for updates on food and entertainment. The Haley-Henman Gallery will feature an art show, “Focus on the Bridge.” The installment features photographs taken by David Clanton, Cecelia Feld, Bob Johnson, Michael Lyon and Alan Robertson. An opening reception for is March 1 at 6:30 p.m., and the show runs Feb. 29- March 5. The weekend kicks off with the a $200-per-ticket party on the bridge at 7 p.m. Lyle Lovett and his band are the evening’s headliners, followed by DJ Lucy Wrubel and Sing-Off runners up Street Corner Symphony. Local cuisine and specialty drinks will be served by Trinity Groves. We’re interested to see the 14-foot Calatrava-inspired costumed performers. Fireworks will end the evening. The eight annual Trinity River Levee Run 5k and 10k races begin at 8 a.m., this year from the west side of the Margaret Hill Hunt Bridge. Runners will cross the bridge, then run through the Design District and back. Contact the Dallas Running Club for more information. Preregistration is $30, and $40 on race day. Following the race is a free street fair at noon, which will be one of the few times during the weekend when pedestrians can walk across the bridge. Food vendors, dancers, radio personalities, local bands and musicians, and sidewalk artist Douglas Rouse will be there, and artwork from the Trinity River Photo Contest and the Trinity River Art Contest will be exhibited. The “Parade of Builders” will honor those who had a hand in building the bridge, including Santiago Calatrava, and interactive booths will chronicle the work of those who are key to the Trinity River Corridor Project. Fireworks will end the street fair at 9 p.m.
A sunrise blessing and ribbon cutting begins at 7:15 Sunday morning and is open to the public. The National Anthem will be performed by Street Corner Symphony, and the Orchestra of New Spain will sing in honor of the Spanish naming of the Trinity River. 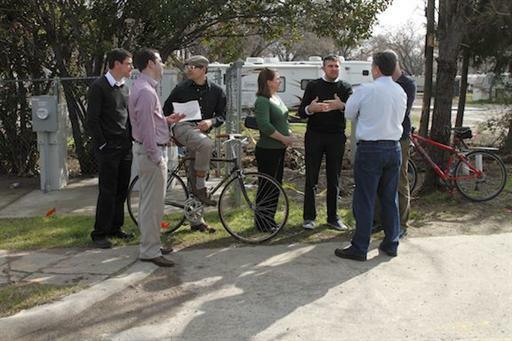 At 1:30 p.m. Bike Friendly Oak Cliff leads a free bike tour chronicling the major historic moments of the Trinity. The ride will navigate several of the adjacent downtown bridges that span the river. As it turns out, the Houston Street Viaduct turns 100 this year. Urban Emergence, a seminar that showcases up-and-coming neighborhoods worldwide for their strides to become popular destinations, will begin at 2 p.m. Held in Methodist Dallas Medical Center’s Hitt Auditorium “technology, urban innovation and futurism converge” as city planners, historians and architects alike discuss what makes these neighborhoods the gems of their communities then and now. 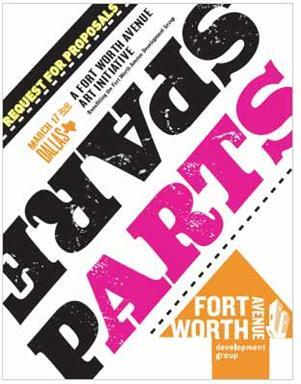 This event will be in partnership with the Dallas CityDesign Studio. Re-Use: Artists are encouraged to make use of recycled, re-used, and re-defined materials in keeping with the spirit of the incremental redevelopment of the neighborhood. Utility: The art is not required to fill a utilitarian role, but projects which fill a secondary purpose (shade, seating, bike parking, etc) are strongly encouraged. - The installation(s) will be placed on private property along Ft Worth Ave in the area between Eastus and Hardwick Streets. The business owners in this area have agreed to host work on their property, and submissions can be situated in any of the areas listed below. - Owners will not vote on selection, but will approve any installation on their property. - The owners of the Foundry/Chickenscratch, the Mission Motel, the Dallas West Retail Trailers, and Butch McGregor’s warehouses and open space on the north side of the street have all signed on to this project. -The project budget is $6000. This amount is to cover materials, supply, labor, and installation costs. View the attached PDF's for further details and information.